One of the most commonly (mis)used pieces of tack is the bit! Almost everyone uses one when riding, and they don’t know the effect the bit they are using, has on their horse, nor what it was designed for. There are a WIDE variety of bits with a wide variety of purposes, but today we are just going to cover the snaffle bit vs. curb bit. The snaffle bit works off of direct pressure, whereas the curb bit works off of leverage. The mouthpiece (inside the horse’s mouth) has no bearing on this. The only piece that decides if you are using a snaffle bit vs. curb bit is the cheekpiece (parts outside the horse’s mouth). A snaffle bit will have one of the following cheekpieces: loose ring (or o-ring), d-ring, eggbutt, full cheek. As mentioned before a snaffle bit works on direct pressure, aka the reins are connected directly to the mouthpiece. 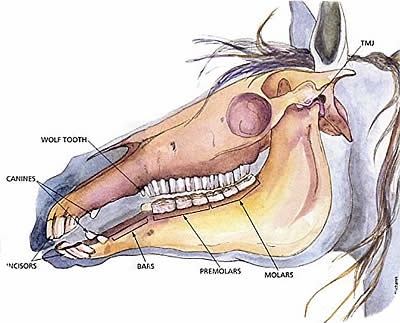 Snaffle bits use a nutcracker action (assuming it’s jointed in the middle) on the bars of the mouth, the corners of the mouth (lips), the tongue, and sometimes even the roof of the mouth. A curb bit is used completely different and applies pressure differently as well. A curb bit is determined by long cheekpieces (shanks) that create leverage on the horse. 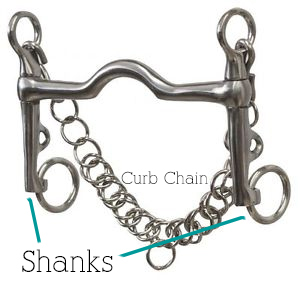 The rein is connected to the end of the shank, which works as a level on the horse’s mouth and under their chin (due to the curb strap or curb chain). Depending on the type of mouthpiece your have on your curb bit, it will put pressure onto the roof of the mouth, the bars of the mouth, or the tongue. A curb bit can also place pressure on the horse’s poll (the top of their head just behind the ears). How hard or far towards you, you pull on a curb bit will affect how much pressure the horse feels on his poll and chin. The longer the shank, the more pressure (basic physics). Now we are going to throw a curve ball at you. There are a few bits (combination bits) that you will use as a snaffle bit AND a curb bit at the same time, so to speak. There are some combination bits such as the Pelham, a Kimberwick, or an Elevator bit. These offer the qualities of a snaffle AND a curb. With a Pelham bit and an Elevator bit, you typically use two reins. One rein on the snaffle ring, and the second rein on the curb ring. You can use your snaffle rein as your main rein to apply direct pressure to the mouth, and you would use your curb rein as needed, to add pressure to the chin and poll and create leverage. A Kimberwick can be setup as a snaffle OR a curb, but is typically not used with two reins. One last curve ball. In dressage you actually use two separate bits at the same time (only in the upper levels of FEI dressage). You use what is called a double bridle and it uses a bradoon bit (snaffle bit with smaller rings for space constraints) and a curb bit on the same bridle. The snaffle bit is the main bit used and is used for elevating and bending the horse, the curb bit is to aid in getting extra collection for some of the harder movements and keeping the horse on the vertical. For today, that is all we will cover, feel free to ask questions in the comments below. And be on the lookout for our next article on bits, where we will dive more into what the mouthpieces are used for.